Severely threatened by climate change, Bangladesh is showing the world how to take an active role in adapting to this situation. Learning from its own experience in coping with floods and cyclones, Bangladesh is taking the lead in international climate change negotiations and attempting to persuade the industrialized world to curb emissions. Bangladesh is one of the countries most vulnerable to climate change – but it is also a country that is capable of coping. Far from being a victim, Bangladesh has lessons for activists, scientists, government and donor officials and concerned citizens who want to know what climate change looks like and how to respond to it. This densely populated country feeds itself because it is in a rich delta. But that comes at the price of a volatile environment – three huge rivers bring floodwaters from the Himalayas and massive cyclones sweep up the Bay of Bengal. Once accurately described as a ‘basket case’ of hunger and disaster, its scientists and engineers, working with local communities, have transformed the country. Strong cyclone shelters and early warning systems now protect at-risk coastal people. Improved rice varieties and irrigation feed the nation and rapidly cut child malnutrition. Women's education has curbed population growth. Along with these changes have come measures to cope with the volatile environment. Climate change makes the problems worse, with higher temperatures and rising sea levels, heavier rain and bigger floods and stronger cyclones. Bangladeshis know what the damaged climate change will bring. The government, researchers and communities are already adapting, raising land levels to match the rise in sea level, strengthening dykes to protect against floods, producing more adaptable rice varieties and improving disaster preparation. Bangladesh is a model of climate change adaptation and a lesson for those who continue to ignore global warming. Bangladeshis have taken a leading role in international campaigning and negotiating, helping to convince industrialized countries to curb greenhouse gas emissions. Because it cannot wait for help from rich countries, Bangladesh has shouldered most of its adaptation costs. Will industrialized countries make the task harder – or will they help Bangladesh by reducing emissions and paying for the damage already done? Manoj Roy is a lecturer in sustainability at Lancaster Environment Centre, Lancaster University, UK. Joseph Hanlon is a visiting senior fellow at the London School of Economics and a visiting senior research fellow at the Open University, Milton Keynes, UK. David Hulme is a professor of development studies and executive director of the Global Development Institute, University of Manchester, UK. 1. Actors, not victims; 2. 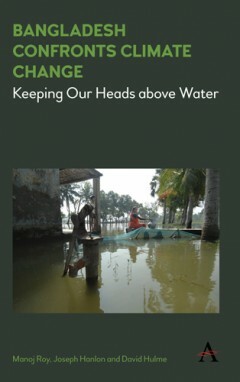 How will climate change hit Bangladesh; 3. Taking the lead in negotiations – and moving forward; 4. Sea level rise and the vulnerable coast, where farmers know more than engineers; 5. Saving lives with cyclone shelters; 6. Living with floods; 7. Agronomists keeping ahead of climate change; 8. No climate change migrants – yet; 9. How can the privatised megacity cope with climate change? ; 10. Is climate change only a problem for the urban poor? ; 11. Power – political, financial and electrical; 12. The front line of climate change; Index.